Contributions Page - Please help with our legal expense fund and our organizing fund! No Pepper Spray on Nonviolent Protesters! 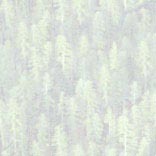 originally Headwaters Forest Defense, et al. v. County of Humboldt, et al. We won a unanimous federal jury verdict that officers used excessive force against us in violation of our Fourth Amendment rights. Although we were awarded only nominal damages, the judge ruled that we were entitled to have defendants pay our attorney fees because our case established important precedents and served the public interest. Defendants threatened to appeal again. Ultimately, a post trial settlement ended the litigation, heading off years of appeals, and with defendants paying our legal team a substantial sum (but far less than they're worth) for their many years of effort! The settlement agreement has been signed by the parties and ratified by the court, and the settlement money has been paid. The litigation is finished after over eight years and three trials! 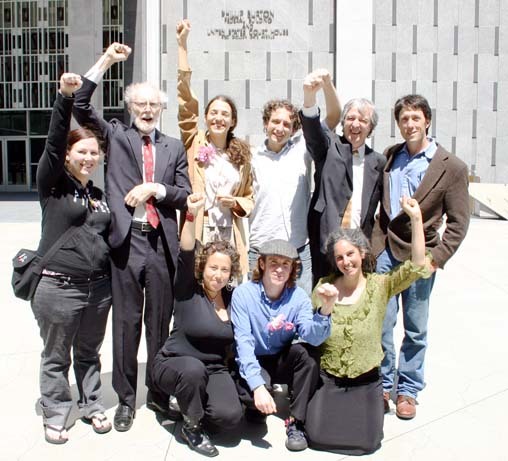 Plaintiff Terri Compost and lawyers Bob Bloom, Ben Rosenfeld, Dennis Cunningham and Tony Serra emerge victorious from the San Francisco Federal Courthouse after learning the jury's verdict on April 28, 2005. AP photo by Eric Risberg © 2005. San Francisco -- An eight-person federal jury returned a unanimous verdict for the Q-Tip Pepper Spray Eight activists/plaintiffs, finding the County of Humboldt and City of Eureka liable for excessive force in violation of the 4th Amendment to the U.S. Constitution. 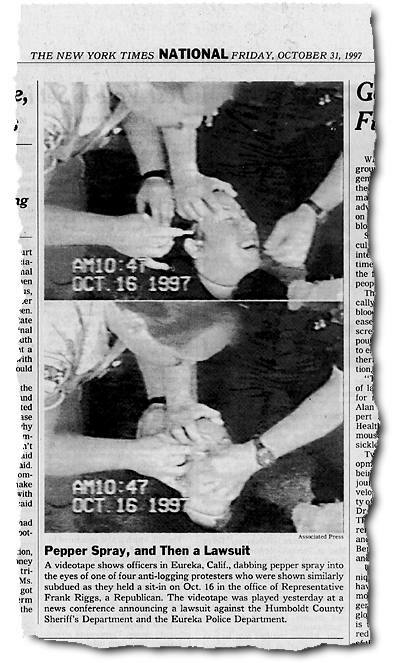 Humboldt County Sheriff's Deputies and Eureka Police Officers used unconstitutional excessive force when they applied pepper spray with Q-tips directly to the eyes of the eight nonviolent forest defense protesters in three incidents in 1997. Three of the activists were also sprayed directly in the eyes from inches away. Two of the young women were juveniles, aged 16 and 17. Former Sheriff Dennis Lewis and current Sheriff Gary Philp also were found liable for causing the use of excessive force by setting policies allowing the unprecedented use of pepper spray on the passive demonstrators, who had locked their arms together inside metal pipes. The plaintiffs laughed and hugged in the courthouse hallways after the verdicts were read and applauded when jurors left their chambers. "They did the right thing," said plaintiff Terri "Compost" Slanetz, a 42-year-old naturalist from Oakland. "We've been trying all along to get a statement that this was illegal. It's a positive step toward people treating each other decently." Juror Athene Aquino, a 35-year-old Citibank employee, said she was convinced the force was excessive by watching a video showing the deputies swapping pepper spray in the protesters' eyes. When she viewed the tape, Aquino said she "started crying. It was just very emotional." The jury awarded nominal damages of only $1 to each of the plaintiffs, who made it clear all along that they weren't suing for the money, but to bring about a change of policy, to prevent the future use of pepper spray in Humboldt in the way it was used on them. They hope and expect that the verdict will reverberate far beyond rural Humboldt County to make it clear that police can not use the extremely painful pepper spray on non-violent people to coerce them to follow orders. Lawyer Tony Serra called the verdict a "mixed metaphor." He said, "The verdict establishes now and forever that pepper spray applied in this fashion in these circumstances is excessive force. That will deter law enforcement officials throughout the country in the use of pepper spay and that's very good." But Serra said, "These young people suffered grievous mental anguish and should have been given a substantial amount of money to recompense them." The defendants may be required to pay the reasonable attorney fees and costs of the plaintiffs, which may exceed $1 million for litigating the case through three trials and multiple appeals as high as the U.S. Supreme Court. Nancy Delaney, a lawyer for Humboldt County and other defendants, said, "We obviously have to examine what the verdict means." Delaney said the defendants will oppose an expected motion by the plaintiffs that the county be required to pay their attorney fees. "The plaintiffs were never in it for the money they were in it for the principle," attorney Tony Serra said. "And we won this on principle. This will deter the use of pepper spray on protesters." Plaintiffs attorney Dennis Cunningham said he thought the decision, which came after a two-week trial, was tough for the jurors but called the verdict "a step forward." "One is forced to a conclusion that this is a compromise," he said. "It's an imperfect verdict in an imperfect world." Despite the low damage amount, one of the plaintiffs said she was still pleased with the precedent. "I don't even care about the money," said Maya Portugal, 23, who now lives in Northern Ireland and works in a coffee shop. "This is a victory for us. If this is going to stop them from doing this to nonviolent people then it was worth it." Portugal was just 16 when she was swabbed with the pepper spray. The civil rights lawsuit was filed at the end of October 1997. After the first trial ended in an evenly split jury in 1998, the judge presiding over the case at the time took it upon himself to decide the case in favor of the defendants, claiming no reasonable juror could find that the actions of the Humboldt officers was excessive force. After appeals overturned that ruling and granted plaintiffs a new trial, a new legal team took over the case for the activists. Further appeals by the new team removed the first judge for the appearance of bias. Judge Susan Illston was assigned to replace him, and a second trial in September 2004 ended in a hung jury split 6-2 in favor of the activists. The third time was the charm, as the jury of six women and two men reached a unanimous verdict after a day and a half of deliberations. Plaintiff Spring Lundberg said on KMUD News (Redway, Humboldt County) that the activists hope law enforcement all over the country will hear this message, that they can't just use pepper spray on non-aggressive people who don't follow orders. She said that some of the women jurors were crying, showing that it was clearly an emotional experience for them. Spring, who was only 17 when she had pepper spray put in her eyes with Q-tips, just turned 25 two days ago. She thanked all of the many people who helped raise money for the costs of bringing the case to trial three times, and all of the people who donated funds and services. 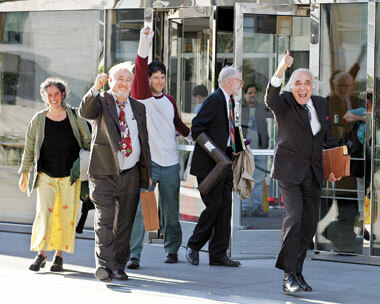 Plaintiffs and lawyers give a victory salute in front of the S.F. Federal Courthouse during their Friday, April 29, 2005 press conference announcing the unanimous jury verdict in their favor. Kneeling are plaintiffs Jennifer "Banka" Schneider, Noel Hewitt Tendick and Terri "Compost" Slanetz. Standing are plaintiff Maya Portugal, lead attorney Dennis Cunningham, plaintiff Spring Lundberg, attorneys Gordon Kaupp and Bill Simpich, and plaintiff Sam Neuwirth. Not pictured are plaintiffs Lisa Sanderson-Fox and Mike McCurdy, and attorneys Tony Serra, Ben Rosenfeld and Bob Bloom. Photo by Nicholas Wilson. Plaintiffs and their lawyers were joined at a press conference Friday by juror Athene Aquino, who provided additional details about the jury's deliberations. She said the nominal $1 per plaintiff damage award was the result of compromises to reach a unanimous verdict. Some of the jurors wanted to award substantial damages to plaintiffs for the pain, suffering and psychological effects inflicted on them. Others felt the force used was excessive, but thought there was no lasting injury, and didn't want to find for the plaintiffs if it meant paying out substantial taxpayer dollars. Ms. Aquino said many of the jurors felt that the jury instructions given by Judge Illston pushed them toward granting only nominal damages. Some of them believed the police witnesses who said pepper spray caused only temporary discomfort rather than the excruciating, extreme pain that plaintiffs testified to. Ms. Aquino said she was convinced by viewing the police videotapes that excessive force was used, and that she cried when viewing the scenes where burly officers held young women roughly and swabbed their eyes with pepper spray drenched Q-tips. Defense lawyer Nancy Delaney told reporters that the award of nominal damages means the defendants will not have to pay the attorney's fees and court costs of the plaintiffs. Plaintiffs' lawyers disagree. Both sides have 30 days in which to file motions before the judge enters the final verdict. Lawyers Dennis Cunningham, Tony Serra and Bill Simpich gave strong statements at the press conference, saying they thought the jury's message was clear enough that using pepper spray on nonviolent demonstrators was unconstitutional, and law enforcement agencies nationwide should take note. Plaintiffs Spring Lundberg, Banka Schneider and Noel Tendick also gave statement saying they felt vindicated by the verdict, and that the long, difficult litigation had been worth it. Links to several detailed news reports have been added to our News and Commentary Index and Links page. Perhaps you remember seeing the TV news showing police swabbing and spraying pepper spray into the eyes of peaceful protesters. Perhaps this is a new exposure to what sheriff's deputies in Humboldt County, California, view as reasonable force in arresting non-violent activists, activists who were, and still are, speaking out to protect the last of the old growth redwood trees in the world. When our story first broke in the media on October 31, 1997, it was on national headline news, including repeatedly on CBS and ABC Evening News, CNN, Fox Morning News, Today Show, Rivera Live, Good Morning America, New York Times, Washington Post, Los Angeles Times, and USA Today, as well as newspapers and television stations across the country and abroad. The publicity and public outrage generated by the incidents instigated an FBI criminal investigation and a review by then California Attorney General Dan Lungren. The review found the use of pepper spray in Humboldt County to be "unprecedented" and in violation of "acceptable police community practices." When the incidents at issue here took place, we were working to protect Headwaters Forest. That work has been carried on by other non-violent activists drawn to this ecosystem who are struck by the horror of this ancient temperate rainforest being completely destroyed. It is for them and the old-growth redwoods that we continue this lawsuit. But it is also for a broader vision that we continue our work. We believe the voice of dissent is crucial to a healthy nation. We feel that every person, no matter what the issue, speaking out in a way that does no harm to others, has an absolute and inalienable right to do so without fear of being attacked or tortured by the police or anyone else. Any attempt to work through the justice system exacts a heavy cost, but we believe the price of silence is too great. So please, take some time to explore the site, feel free to contact us, and whether or not your particular views resonate with our own, speak out. We are living in an ever-increasing police state, where the government strips our basic rights, and we are expected to silently acquiesce. Now is the time to assert your freedoms promised to you by the Bill of Rights. As Edward Abbey said, "Sentiment without action is the ruin of the soul." Scenes from the shocking police videos which brought international outrage and condemnation on the Humboldt County Sheriff's Office. Terri Slanetz (left) is pepper sprayed directly in the eyes from only 2-3 inches away, risking permanent injury to her eyes. 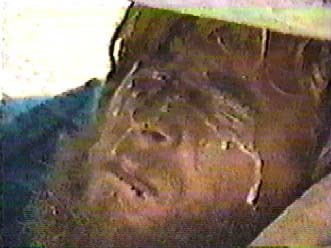 Deputies pepper sprayed Mike McCurdy (above) and Noel Tendick directly across the eyes at close range while they were locked together through the tracks of a Pacific Lumber bulldozer on an old-growth redwood logging site. The activists endured the torture and did not unlock. Deputies safely cut them loose with a portable grinder, as they could have done without using pepper spray, and as they had done for years previously. San Francisco--After only twelve hours of deliberation, the federal jury returned a unanimous verdict finding that Humboldt County Sheriffs used excessive force when they swabbed pepper spray into the eyes of forest activists. The jurors found that former Sheriff Dennis Lewis and current Sheriff Gary Philp approved illegal use of force on passive protestors. The jury also held the City and County liable for its officers’ unconstitutional actions. The activists injured by the sheriffs’ applications of pepper spray sued the Humboldt County Sheriffs' Dept. and Eureka Police in fall of 1997, arriving at the current trial in federal court in San Francisco after two previous trials that ended without verdict. San Francisco--After three days of deliberations, a federal jury returned a verdict finding that Humboldt County Sheriffs used excessive force when they daubed liquid pepper spray into the eyes of forest activists. The eight activist plaintiffs were arrested in 1997 at three separate protests in Humboldt County as they worked to save the Headwaters Forest from logging. The unprecedented application of pepper spray on passive, immobile protesters was part of a "get tough policy" implemented by the County as more and more people protested liquidation logging of redwoods in Northern California. The activists injured by the sheriffs’ applications of pepper spray sued the Humboldt County Sheriffs' Dept. and Eureka Police in 1997, arriving at the current trial in federal court in San Francisco after two previous trials that ended without verdict. Courtroom graphic © 2005 K. Rudin. Plaintiffs' attorney Bob Bloom questions witness Dave DuBay, former employee of pepper spray manufacturer Defense Technologies and present employee of Taser International, Inc., as defense lawyer Nancy Delaney raises her hand in objection. The plaintiffs and their legal team are in the foreground. The defense legal team is in the left background. The eight jurors are in right background. KMUD News Director Estelle Fennell gives a detailed report on the verdict, including interviews with Spring Lundberg, Dennis Cunningham, Humboldt Sheriff's spokesperson Brenda Gainey, and juror Conni Chandler. Running time is approximately 13 minutes. 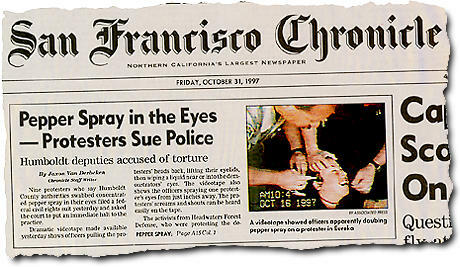 A compilation of November 1997 editorials by the San Francisco Chronicle, San Francisco Examiner and Los Angeles Times shows they were unanimous in condemning as torture and police brutality the actions of the Humboldt County Sheriff's Department in this case as shown on the shocking police videos first released to the media and shown on national TV on October 31, 1997, when this lawsuit was first filed. When Police Play Russian Roulette… makes the case for an immediate moratorium on police use of pepper spray. As the report explains, pepper spray is a chemical weapon that has never been properly tested. With one exception, all the available research into pepper spray raises serious questions about its safety for use on humans. The one study that claims pepper spray is safe for use by law enforcement agents has since been thoroughly discredited. It was conducted in 1991 by former FBI Agent Thomas Ward who pled guilty to accepting $57,500.00 in kickbacks from a pepper spray manufacturer. This report provides a comprehensive overview of all the available literature on pepper spray (as of 2000). We are happy to reprint an article from the North Carolina Medical Journal summarizing the medical literature on pepper spray health hazards as of 1999. Because the journal has undergone a change of ownership and management, and its website no longer provides archives of articles published before 2002, we are pleased to republish the article on this site for nonprofit educational purposes under the Fair Use provisions of U.S. copyright law. A day-by-day report on the trial. Note: We suspended updating the log daily after April 18 due to the press of other duties, including taking the daily trial notes for the legal team. go to the Contributions page for information on making an online donation by credit or debit card or mailing a check or money order. The news continues below the Introduction section for new site visitors. Return visitors can click here to skip the Introduction and jump to "More News" (after this page has finished loading, which can take over a minute on slower dialup connections). Please scroll down for the main home page content below. [I]t would be clear to a reasonable officer that using pepper spray against the protesters was excessive under the circumstances. The facts reflect that... the pepper spray was unnecessary to subdue, remove, or arrest the protesters (citing Graham v. Conner). Characterizing the protesters' activities as "active resistance" is contrary to the facts of the case. Defendants' repeated use of pepper spray was also clearly unreasonable. [A] continued use of the weapon or a refusal without cause to alleviate its harmful effects constitutes excessive force. Because the officers had control over the protesters it would have been clear to any reasonable officer that it was unnecessary to use pepper spray to bring them under control, and even less necessary to repeatedly use pepper spray against the protesters when they refused to release from the "black bears." It also would have been clear to any reasonable officer that the manner in which the officers used the pepper spray was unreasonable. (Defendants) Lewis and Philp authorized full spray blasts..., not just Q-tip applications, despite the fact that the manufacturer's label on the canisters... 'expressly discouraged' spraying... from distances of less than three feet. [I]t would have been clear to any reasonable officer that defendants' refusal to wash out the protesters' eyes with water constituted excessive force under the circumstances. Spraying the protesters with pepper spray and then allowing them to suffer without providing them with water is clearly excessive under the circumstances. [R]egional and state-wide police practice and protocol clearly suggest that using pepper spray against non-violent protesters is excessive. Note: For legalistic reasons, the jury in our current trial is not allowed to hear about the 9th Circuit's clear ruling in our favor or any of the specific findings listed above. "I'm joining this case in smoldering anger because applying the noxious ... pepper spray was torture. This case will be vigorously prosecuted, and it will be a political trial, and I'm proud of it." The Times-Standard (Eureka CA) broke the news in its Dec. 2, 2005 edition that the parties in the nearly decade-old Pepper Spray by Q-Tip civil rights case are nearing a final resolution of the matter. The Times-Standard reported that an agreement in principle has been reached to settle the case, including payment of a compromise amount for the activists' attorney fees, without any further appeals. The article quoted Humboldt defense attorney Nancy Delaney saying, "It really, really is over if all this gets signed." The Associated Press sent a brief version of the T-S story over its news wire. KMUD radio news (Redway/Garberville CA) also reported the news Dec. 2, including an interview with plaintiffs' attorney Dennis Cunningham, who said he was surprised that the tentative agreement had been leaked to the Times-Standard. Cunningham confirmed that an agreement in principle has been reached, but cautioned that it isn't final until it has been signed off on by all parties. The Eureka Reporter followed up Dec. 4 with more details, quoting both Delaney and Cunningham confirming a settlement has been agreed to, and saying the parties have agreed to an amount for plaintiffs' attorney fees which is substantially less than the approximately $2 million asked for in plaintiffs' fees motion. Cunningham said that is normal in settlements. "There’s a saying that when there is a good settlement, neither side is satisfied," Cunningham said. "But we are certainly committed to the terms that are being processed in the agreement. "In the settlement that is going forward … yeah, we’re fine with it." Delaney said that once all the documents are signed, "Everything will end up being dismissed, including appeals. We had a meeting on Nov. 1, where a tentative agreement was reached and we’re awaiting various approvals." Such approvals, Delaney said, are from governmental joint powers boards, plaintiffs, etc. The settlement "is in the process of being finalized right now," Delaney said. "I would expect (it will be finalized) within a matter of weeks, not a matter of months." Our plaintiffs' motion for a specific amount of attorneys fees and expenses was filed September 16, 2005, with the U.S. District Court in San Francisco, the trial court. The twenty-four page notice, motion, and memo of points and authorities is available online from our Legal Documents Index page. The motion concludes: "Plaintiffs believe that an award of $1,995,490.69 in attorneys’ fees, plus $84,029.55 for nontaxable expenses, is reasonable under the circumstances of this case." The hearing on the fees amount motion has been postponed to a date to be announced in December, 2005, before Judge Susan Illston. Defendants have filed an appeal of the final judgment in the case, and have indicated on the appellate form that they intend to appeal the attorney fees award. Nevertheless, our attorneys advise that the appeal does not block the trial court from deciding the attorney fees motion. The fight goes on. Defendants Humboldt County and the City of Eureka served notice September 9, 2005 that they will appeal the verdict and final judgment in this case as well as the judge's ruling that we plaintiffs are entitled to reasonable attorneys fees. A Civil Appeals Docketing Statement form filed by defendants' attorneys Nancy Delaney and William Mitchell states that the "Appellate issues include, but are not limited to, entitlement to attorneys' fees following a nominal damage award, excessive force (Fourth Amendment) and qualified immunity." The form also states that the appeal will turn on the interpretation or application of the case of Farrar v. Hobby (1992), a case dealing with the award of attorney fees in civil rights cases where only nominal damages were awarded. Another issue raised is the "Viability of excessive force claim without physical or mental injury, or compensable pain." Ms. Delaney told a reporter recently that she thought the Supreme Court would like to look at this case. Previous defense appeals in this case following the first trial reached the Supreme Court twice, but the defendants lost those appeals. The appeals court has issued a Time Scheduling Order listing the dates when various papers must be filed. The defendants must file their appeal brief stating the specifics of their appeal by Dec. 27, 2005. The Docketing Statement and the Time Schedule for the appeal are available on our Legal Documents Index page. A full copy of the court order is available on our Legal Documents Index page. KMUD News interviews Spring Lundberg and attorney Dennis Cunningham about the meaning and interpretation of Judge Illston's ruling that defendants must pay some of activists' attorney fees. This case reaffirmed the Fourth Amendment right of every individual to be free from excessive police force, and illustrated the importance of keeping governmental power in check and continually refining the parameters of individual liberties. Not only did this case end in a constitutional and philosophical victory for Plaintiffs, it achieved an overall success that reaches beyond the boundaries of this litigation. This case resulted in a multitude of positive effects from legal, practical, political and social-cultural perspectives, benefiting all future peaceful protestors and society as a whole. Specifically, this case created the legal precedent that using pepper spray against peaceful protestors can constitute excessive force under the Fourth Amendment. This case resulted in significant procedural rulings regarding qualified immunity and directed verdicts. This case also spawned state-level legislative and administrative action, changes in police policies and practices, legal proclamations from politicians at all levels of government, and public education and awareness of police use of force and constitutional rights. Plaintiffs and their attorneys made immense personal sacrifices in fighting for the principles of this case and are entitled, consistent with the intent of Congress, to be justly compensated with reasonable attorney’s fees for the successes they achieved. Lawyers for the defendants filed a post-trial motion asking the judge to throw out the unanimous jury verdict of excessive force and either decide the case in their favor as a matter of law (like the first judge in the case erroneously did before he was overruled by the Court of Appeals) or grant them a new trial. Our lawyers filed our opposition to the defense motion and own post-trial motions reviving our motion for an injunction barring the use of pepper spray torture on non-violent locked down protesters. Last fall the judge denied our motion for injunction on the basis that first there needed to be a jury verdict in our favor. Now that we have that verdict, it is time to reconsider an injunction against the Humboldt County defendants and perhaps also against the California Commission on Police Officer Standards and Training (POST). After the 1997 pepper spray incidents in our case, POST, with the participation of two Humboldt officers on a POST advisory committee, changed the statewide policy recommendations to allow police use of pepper spray on passive resisters. In fact the new POST guidelines abolish the distinction between active (violent) and passive resistance to arrest (such as going limp or using a lockdown device), going so far as to label passive resistance "an oxymoron." In our view, POST changed the policy after the highly controversial and nationally publicized incidents in our case to try to cover the behinds of the Humboldt defendants. 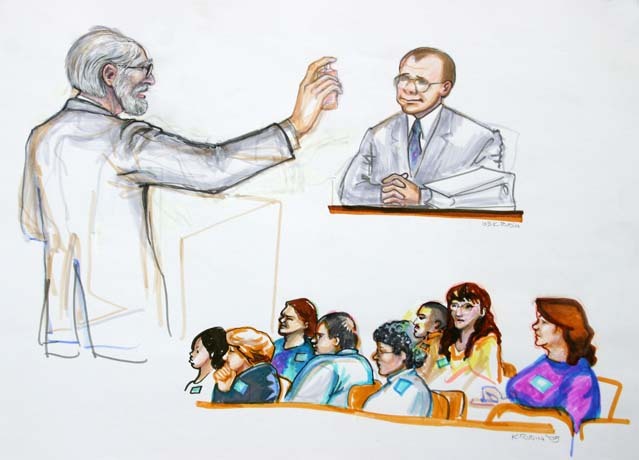 The hearing on the post trial motions took place on Friday July 29, 2005. The judge denied the motions. The Plaintiffs' Post-Trial Motions and Opposition to Defendants' Motion For Judgment or A New Trial has been added to our online Legal Documents Index Page as a PDF file. See our News and Commentary Index and Links page for a selection of news stories about the verdict. Also check our Audio Files Index Page for radio news stories and interviews about the case. See our Legal Documents Index Page for a large selection of official documents. Lead counsel Dennis Cunningham questions Humboldt County Sheriff Gary Philp. 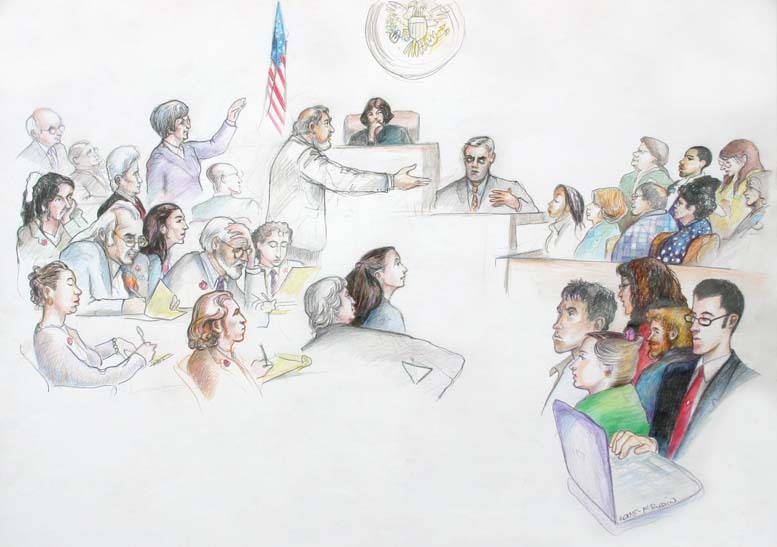 Courtroom art by K. Rudin. Spring Lundberg's new single Up To Us is a spunky folk-rock tune about personal change and social change being interwoven, and ultimately being up to no authority, but really just "up to us." Do it yourself! Return to the Site Index in the left column at top of this page. Based on our case, Fire In The Eyes is a powerful, unnerving look at Humboldt County's policy of using pepper spray directly on the eyes of non-violent protesters. This 32 minute portrayal of the controversial police torture tactic -- euphemistically called "pain compliance" -- shows the dark side of law & order. Though disturbing in subject matter, this movie is entirely watchable, and needs to be seen! Produced by James Ficklin of Headwaters Action Video Collective/Earth Films. You can watch it online from the Free Speech TV site. With chilling deliberateness, a deputy sheriff dips a cotton swab into a cup filled with pepper spray. He approaches 16-year-old Maya who is sitting quietly on the floor with a soft, brown hat on her head. A police officer forces back her head and pries open her right eye. The swab is swept across her lower eyelid. The girl stifles a sob. They repeat the operation on her left eye. She shakes her head as if to shake off the intense pain. She could be your daughter, my daughter. She wasn't threatening anyone. She wasn't violent. She had no weapon. Moments before she had been smiling. Now her head is bent as her eyes burn. This isn't a scene from a South American torture squad, this is Humboldt County, Calif. The uniforms crouch as they shuffle over to the next protester in the circle. They show no anger. Their actions are cool and purposeful. Someone gave them orders. They are following them. One grabs Jennifer's head. "Will you release yourself?" he demands. "Don't," she pleads, "please don't." They smear her eyes with pepper spray. All four women who sit in Congressman Frank Riggs' Eureka office moan in pain. Lisa kicks her feet to trample the pain she feels. Their eyes are closed tight. They scream out. Terri yells, "They are torturing American citizens with pepper spray." Note: Britt Bailey, M.A., is Senior Associate with the nonprofit Center for Ethics and Toxics [CETOS]. She teaches Environmental Policy at the College of Marin. Dismissed as "tree huggers" and "hippies", environmentalists are seen as nuisances to the progression of business deals and promising economic gains. What the "tree huggers" see with their intuitive eyes deserves the light of day. I find it ironic that when people protest against the cutting of the trees, police choose a weapon which blinds them. The very eyes that see the inherent value of a tree are being blinded by those costing out the board feet and putting timber acres into economic equations. To those blinded, the trees are priceless, as is the eyesight of the protesters. The "pepper" spray is anything but the innocuous chemical a Federal judge recently concluded. Its chemical ingredient, oleoresin capsicum, is a highly noxious liquid that produces profound effects at very small doses. The manufacturers warn not to spray within two feet of the face. Humboldt County California police have ignored this warning and directly applied the liquid to the corners of the protesters eyes. The protesters refused to trade their safety for the key to the handcuffs which hold back the logging trucks from reaching the ancient Headwaters garden. The public is left with a dialogue debating the use of pepper spray while another tree tumbles to its death. Left out of the conversation is the little known facts about capsicum, such as its mutagenicity, its ability to aggravate the airways in those suffering from asthma, and its possible links to cancer. Pepper spray is not an irritant, but an inflammatory agent. It swells the mucosal membranes causing extreme pain and temporary blindness. Ask a blind person what they would give for two minutes of perfect eyesight where they could stand under an age-old redwood and look up through the shimmering sunlight and cathedral like shadows dancing through the leaves. Ask someone who is blind what they would give for a two minute look into an old growth forest complete with six foot ferns. Protesters are not merely seeking to conserve resources, they understand the need for the trees’ preservation. The Legal Documents Index Page lists case documents available online. See our Contributions Page for information on donating to our legal and education funds. Visit our Links Page for pointers to allies and useful information. See our FAQ page with questions and answers about our case. Read Health Hazards of Pepper Spray, a medical journal article. The Archive Page contains older case updates and bulletins moved from this home page. Jump to the Site Index in the left column at top of this page.